Congratulations Ms Miller, you have a fine new … tunic! Good news! My tunic at long last is complete (KwikSew 3870). And more good news. I’m actually rather pleased with it. Now considering this might be the most basic pattern in all patterndom, that may not be high praise, but compared to my first attempt (here), it’s a big improvement. My expression here has less to do with the garment than it does with my camera/model capabilities. Imagine, if you can, this was the best pic of the lot. My topstitching was not too straight the first go-round. If only I had checked into the goodies that came with my sewing machine. Such as this handy presser foot – the Bernina Edgestitch foot #10. What a marvelous discovery for Tunic No.2! 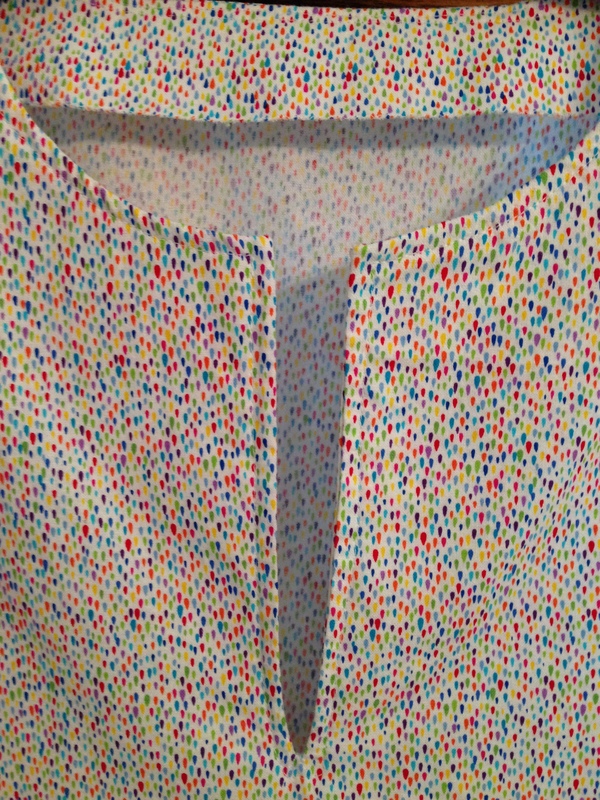 Too bad I discovered it after finishing the topstitching at the neckline, but thank goodness for a busy pattern and disappearing white thread. Also, the neckline is supposed to come to a point. Mine comes to a very special kind of point – rounded! Argh. Does anyone have any tips? With no new adjustments, Tunic No.2 seems to fit a little better than No.1. It might be the higher neckline on this version, the other one just falls off my shoulders. The whole thing is much too long for my stumpy legs. Should probably nix the tunic idea for now and try a proper blouse next time. I do prefer the longer sleeves of Tunic No.1, but No.2 is very summery (summer is almost over actually, so my timing may not have been perfect). While I may admit to poor seasonal timing, I refuse to be held completely accountable for any mistakes….how can one follow instructions when said instructions are so thoroughly hidden? Guard cat is a tad too committed. My next project is ready to go – pattern downloaded, fabric(s) purchased. It’s an apron, but not just any apron, and I hope it lives up to my expectations. And after that, a skirt, and then pants! PANTS for Pete’s sake! I’ve had several suggestions, so think I’ll start with pj’s and then move on to a pair of real pants. And somewhere along the way, I am planning to make a nice bag. Is it ever acceptable to begin a sentence with “and”? 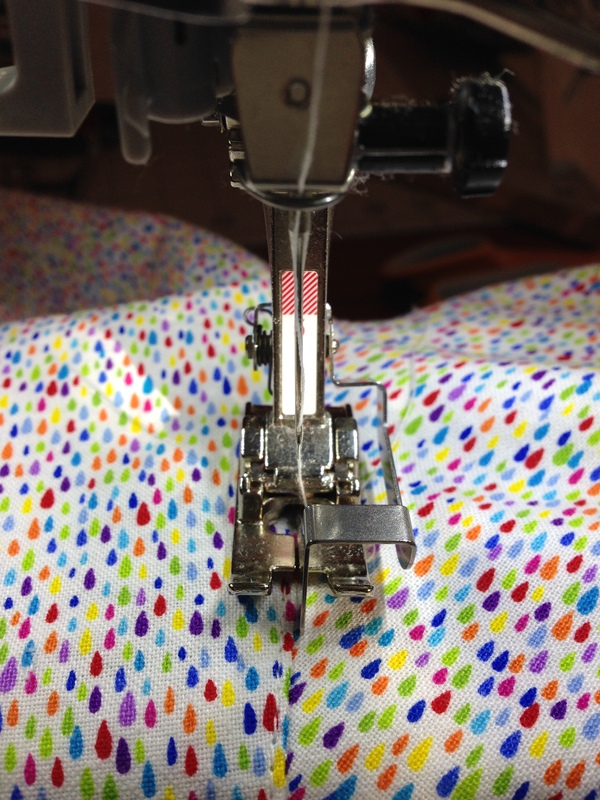 Some of my favorite bloggers have remarked lately on losing their sewing mojo (sew-jo?) and it seems that mine is finally ramping up. However, I sew at snail speed (slo-sew-jo?). Hopefully this little detail will improve with time and practice. Or perhaps I’ll just determine that my perfect pace is a leisurely one and embrace it! This entry was posted in completed project, Sewing, Uncategorized and tagged Bernina Edgestitch foot #10, completed project, KwikSew 3870, topstitiching by jendavismiller. Bookmark the permalink. Oh your cat is so much like my Chester! He lies on things that I want to use all the time! I like your tunic and think your large mirror is what I need so that I can take better pictures too…your home looks like it might be our vintage too…1912? Ah, my Freida. She is a lovebug, a nuisance, and to the little cat she is a monster. But I couldn’t love her more. That big mirror is a heavy thing and we’re sampling out spots to hang it. We may have found the right place on the stair – it’s not really large enough to use as one of those fabulous leaners but I worry it will pull down the picture rail. Our house is indeed the same vintage – 1910! So much character in these old homes. I think it’s okay to begin a sentence with an “and,” but I might just think that because I like to do it, too. 😉 Anyway, the tunic looks good! When I make a neckline like that, it always turns out a little rounded; I don’t know that there’s a way around that, considering the layers of fabric you wind up with there. Thanks! The instructions said to sew to the point, but the illustration looked a little rounded…..my head was spinning. Glad it’s not just me! And yes, so much fabric there I was surprised it pressed out flat. My tip would be to decide on rounded from the word go, even to exaggerate the curve. I have a Bernina, but don’t seem to have that edge stitch foot – mind you there are lots of gadgets with my machine that I haven’t a clue how to use! I could do with a Bernina tutorial. Go round! I might just do that…. As to the foot. Well, ahem, I watched a youtube demo. it was all about the No.10 foot. Which looked and behaved exactly like the foot I was using. Lo and behold, I was using a No. 5 blindstitch foot! Maybe the video was old? It doesn’t seem like the feet would change? I believe this requires further investigation!! And oh yes, the tutorials. I should perhaps even attend a “get to know your sewing machine” at the store, don’t you think? Not so easy here, in rural France. The shop is tiny, and not a regular Bernina dealer. 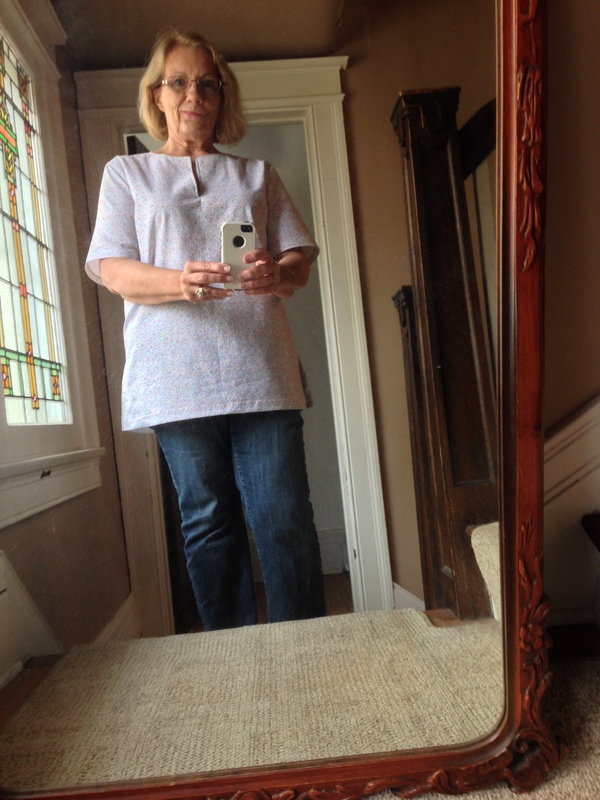 Your tunic looks great and the Bernina edge stitch foot 10 is my favourite, glad you found it even if a little too late! Re the pointy bit! Have you tried using very small stitches at the point and even strengthening with fine iron on interfacing, before snipping right into the point? Enjoy reading about your exploits and I do wish I was allowed a cat! They are so funny. It is a fabulous foot! Had some difficulty though, finding which direction to go (oh, that was almost too embarrassing to admit). Great help for the neckline slash, thanks! I didn’t use tiny stitches at the point, but I did use the interfacing, and I stitched around the end of the slash, not right up to it. That sounds so dangerous? Maybe a few practice runs on leftover material might be in order. So glad you enjoy my ramblings! And the cats make it into the mix quite often – silly creatures. I think it is totally acceptable to begin a sentence with AND. And I do it all the time! 😉 Nice tunic. I would love to learn about all the special feet out there and what they do. Now I need to go look at mmine and see if I have one of those! I love my buttonholer of course. And I have a tiny hem foot that is wonderful. It doesn’t look like I have a no 10 tho. Guess I’ll have to add that to my wish list! Haha… must have been some GOOD coffee! 😉 I will research before I buy. There are SO many feet out there! It’s great that you are progressing and already talking about pants/trousers. I put off making trousers for ages and, when I finally made a pair, they were quite easy but it’s the fitting of them that I find difficult. There’s not many things less flattering than a badly fitting pair of trousers so I either need to work on that some more or, the way I feel at the moment, give up pants altogether. Off on my hols tomorrow so I am hoping to come back revitalized with my sewing mojo fully restored. Thank you! And see, you put it off, and then found it was easy, that is so encouraging to me, being such a timid sewist. And fitting is absolutely terrifying! I know nothing beyond lengthening, shortening, or making a dart! Here’s hoping your holiday will be refreshing, relaxing, and rejuvenating! And I have no doubt your sewing mojo will be restored. Oh, I hope you are bringing The Dark Dividing? I really did enjoy it. Cheers and happy vacationing!! Well done Jen. You have nailed the fitting. The construction is very impressive, as it is pretty hard to get the point feature very accurate without lots of practice. Sewupgifts advice is spot on. Love the guard cat – very funny. And of course “and” can start a sentence. It’s your blog, my dear. It is a very nice tunic. I bet no one else sees what you see on it. I am so happy I have many feet for my machine. I have yet to use them all… But someday! I have two cats. 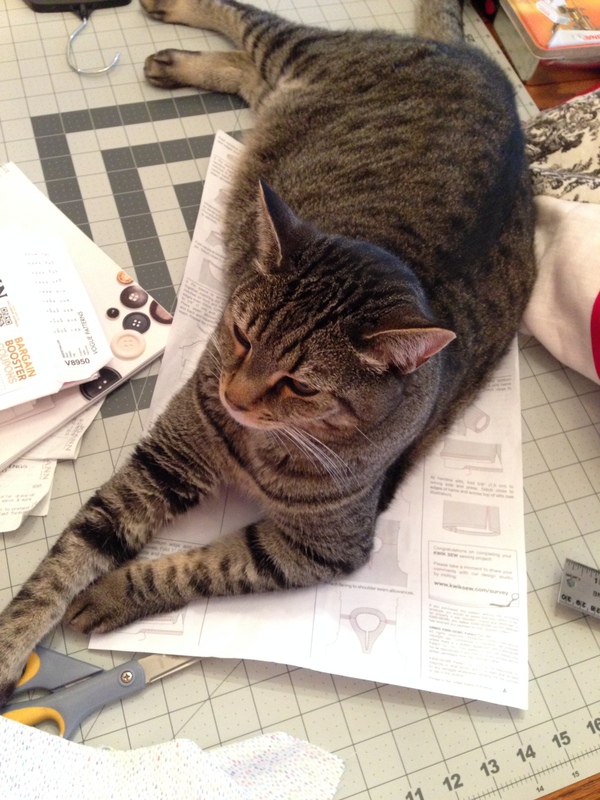 They fight for position on the pattern instructions I want to read, or the fabric I want to cut! Such fun! Oh thank you! It’s quite plain, but it works and was great practice. I think all the foot options are just so amazing (and a bit confusing). Two cats are better than one, double the weirdness, right? And why, oh why must they always sit right on top of our work!??! Couldn’t they just observe from the outskirts? You pose a lot of cat questions that don’t have an answer! Thank you Ali! I’m thinking it will get quite a lot of use. Oh yes, I could do that! It would certainly jazz it up a tad. Now regarding the neckline point – and this will sound completely looney – but you do the cutting after the stitching? Not the other way around? I’m going to do some practice runs I think, using the tiny stitch – and just cut right into it, it seems to be a well known technique in my little “group”. Isn’t a big fun global community! It was rather exciting to see a package from overseas amongst all the run-of-the-mill pieces. Couldn’t wait to see what it contained! Thanks a bunch to your number pulling crew! Oh that sounds so simple! I was trying to sew around the slash just by eye (and these eyes are not so young) which was totally inefficient. Next time I choose to go pointy, I will definitely remember this tip.